Buddy, check this one out. This is not a purchase rug with a manufactured texture. It's straight-up, everyday home improvement store carpet, with a handmade, labyrinth-like pattern. Can you guess how they pulled it off? Garish casino carpets are deliberately chaotic. And you thought they got a closeout deal at Carpet World, no sirree. These are custom casino style carpets you'll only seen in Vegas and other casino joints. Now how bad can they really be? Looking down onto her front porch, Jennifer had an epiphany. "It's July," she observed, "but that's a Halloween-themed welcome mat." So, she grabbed some paint and got to work. The results? 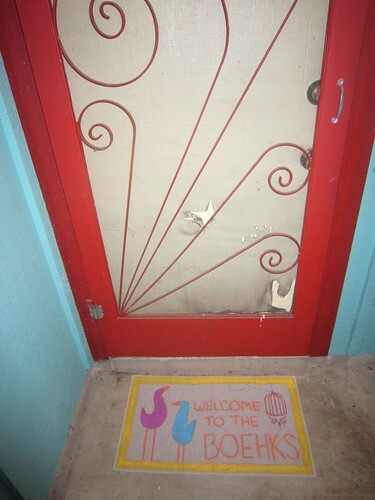 A fun and playful welcome mat that spans the divide between handmade and standing up to the elements. Using some soft fabric paint, she created a bold border, then used an embroidery pattern to give the whole thing some character. All hail the comb-over! Not on bald dudes' heads; on this carpet by Meirav Pled Barzilay, which has a bald spot. (Not the designer, the carpet.) Its comb-over is supplied by 'felt strands of varying lengths'. So long are they that they can be used as a blanket or pillow. How To: Hide Wires in Between Your Carpet and Wall. This trick is a classic: Instructable-maker Condongolev highlights the basic, but clever, technique of sliding cables, cords, and wires in that tiny groove between the carpet and the wall. Just extend the wire, and use a pointed, but blunt object (like a broken pencil) to push it into the little space. Works great for speaker wire, coax cable, power supplies, etc. Although I included links to these handy guides in my CSI: Carpet Scene Investigation post, I thought they deserved a post of their very own. First, from Fabric Link comes an alphabetical who’s who of horrible stains. From acid toilet cleaners to wine, there’s something for everybody. Also worth a look-see is 3M’s stain removal guide, which they bill as alternatives to using one of their own products. How magnanimous of them. 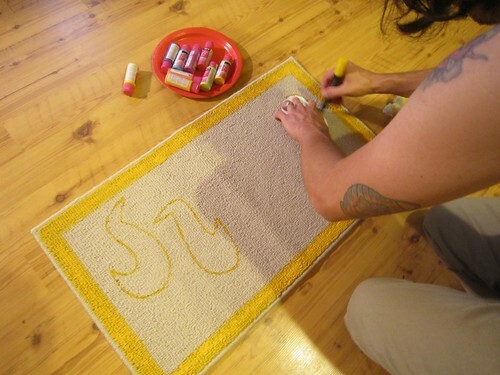 If you’ve ever been in the market for carpeting, you know what a daunting job it can be. Besides color and style, there’s a whole carpet lexicon that only makes matters worse. By identifying and defining these individual terms, we might be able to get to the bottom of the conundrum of choosing the perfect carpeting. There are three terms that describe the construction of a carpet’s surface. They are weight, density and twist. Cartoon Carpets by Dan Golden. "Dan Golden is a New York based artist who has shown his playful yet sophisticated work in galleries for nearly a decade. In 2006, born from a desire to reach beyond the art world, Golden partnered with interior designer Ford Lininger. Together, the two developed a line of luxurious, contemporary rugs based on Golden's art and launched the collection in Spring 2007."